Gina's EH was fostered only two days when his foster family FELL IN LOVE! EH now ACE (named after Batman's dog) is a special boy. 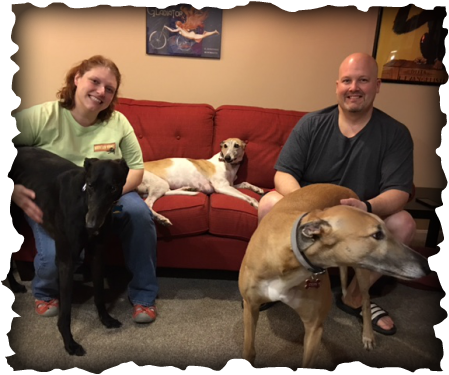 He was the kennel favorite and they really hated to let him go, but complimented us by saying we are the best group they work with and knew we would find a greyt home for him. YES that happened with Mel and Jon. They have supported GAGC by always helping at events, dog runs, etc. On the couch is Lilly and Odin is a bit camera shy, he is the big red boy. They also have cats that didn't want in the family photo. I'm so happy this boy found his forever home with this family! Timing is everything!